The next generation of cellular networks need to be much more energy-efficient than the current generation, if we should deliver 100-1000 times more data in a cost-efficient and environmentally friendly manner. In this video, I explain the methodology that can be used to design energy efficient 5G networks, and also the key role that Massive MIMO will play. I wrote this paper to make a single point: the hardware distortion (especially out-band radiation) stemming from transmitter nonlinearities in massive MIMO is a deterministic function of the transmitted signals. One consequence of this is that in most cases of practical relevance, the distortion is correlated among the antennas. Specifically, under line-of-sight propagation conditions this distortion is radiated in specific directions: in the single-user case the distortion is radiated into the same direction as the signal of interest, and in the two-user case the distortion is radiated into two other directions. The derivation was based on a very simple third-order polynomial model. Questioning that model, or contesting the conclusions? Let’s run WebLab. WebLab is a web-server-based interface to a real power amplifier operating in the lab, developed and run by colleagues at Chalmers University of Technology in Sweden. Anyone can access the equipment in real time (though there might be a queue) by submitting a waveform and retrieving the amplified waveform using a special Matlab function, “weblab.m”, obtainable from their webpages. Since accurate characterization and modeling of amplifiers is a hard nonlinear identification problem, WebLab is a great tool to researchers who want to go beyond polynomial and truncated Volterra-type toy models. A -spaced uniform linear array with 50 elements beamforms in free space line-of-sight to two terminals at (arbitrarily chosen) angles -9 respectively +34 degrees. A sinusoid with frequency is sent to the first terminal, and a sinusoid with frequency is transmitted to the other terminal. (Frequencies are in discrete time, see the Weblab documentation for details.) The actual radiation diagram is computed numerically: line-of-sight in free space is fairly uncontroversial: superposition for wave propagation applies. However, importantly, the actual amplification all signals is run on actual hardware in the lab. The Matlab code for reproduction of this experiment can be downloaded here. No, these are two different but somewhat related concepts, as I will explain in detail below. Contemporary multiantenna base stations for cellular communications are equipped with 2-8 antennas, which are deployed along a horizontal line. One example is a uniform linear array (ULA), as illustrated in Figure 1 below, where the antenna spacing is uniform. All the antennas in the ULA have the same physical down-tilt, with respect to the ground, and a fixed radiation pattern and directivity. Figure 1: Azimuth 2D beamforming from a horizontal ULA. By sending the same signal from all antennas, but with different phase-shifts, we can steer beams in different angular directions and thereby make the directivity of the radiated signal different from the directivity of the individual antennas. Since the antennas are deployed on a one-dimensional horizontal line in this example, the ULA can only steer beams in the two-dimensional (2D) azimuth plane as illustrated in Figure 1. The elevation angle is the same for all beams, which is why this is called 2D beamforming. The beamwidth in the azimuth domain shrinks the more antennas are deployed. If the array is used for multiuser MIMO, then multiple beams with different azimuth angles are created simultaneously, as illustrated by the colored beams in Figure 1. Figure 2: Elevation 2D beamforming from a vertical ULA. If we would rotate the ULA so that the antennas are instead deployed at different heights above the ground, then the array can instead steer beams in different elevation angles. This is illustrated in Figure 2. Note that this is still a form of 2D beamforming since every beam will have the same directivity with respect to the azimuth plane. This antenna array can be used to steer beams towards users at different floors of a building. It is also useful to serve flying objects, such as UAVs, jointly with ground users. The beamwidth in the elevation domain shrinks the more antennas are deployed. 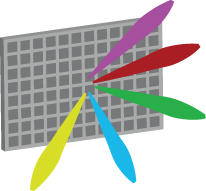 Figure 3: 3D beamforming from a planar array. If we instead deploy multiple ULAs on top of each other, it is possible to control both the azimuth and elevation angle of a beam. This is called 3D beamforming (or full-dimensional MIMO) and is illustrated in Figure 3 using a planar array with a “massive” number of antennas. This gives the flexibility to not only steer beams towards different buildings but also towards different floors of these buildings, to provide a beamforming gain wherever the user is in the coverage area. It is not necessary to have many antennas to perform 3D beamforming – it is basically enough to have three antennas deployed in a triangle. However, as more antennas are added, the beams become narrower and easier to jointly steer in specific azimuth-elevation directions. This increases the array gain and reduces the interference between beams directed to different users, as illustrated by the colors in Figure 3. The detailed answer to the question “3D Beamforming, is that Massive MIMO?” is as follows. 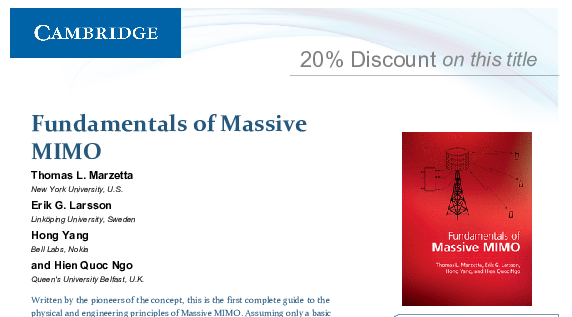 Massive MIMO and 3D beamforming are two different concepts. 3D beamforming can be performed with few antennas and Massive MIMO can be deployed to only perform 2D beamforming. However, Massive MIMO and 3D beamforming is a great combination in many applications; for example, to spatially multiplex many users in a city with high-rise buildings. 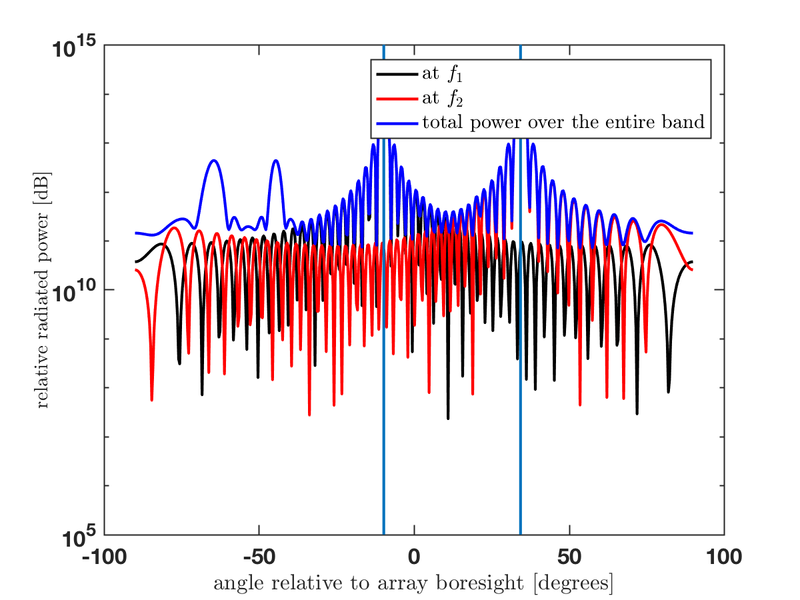 One should also bear in mind that, in general, only a fraction of the users are located in line-of-sight so the formation of angular beams (as shown above) might be of limited importance. The ability to control the array’s radiation pattern in 3D is nonetheless helpful to control the multipath environment such that the many signal components add constructively at the location of the intended receiver. Can we utilize the channel hardening to estimate the channels less frequently? Unfortunately, the answer is no. Whenever you move approximately half a wavelength, the multi-path propagation will change each element of the channel vector. The time it takes to move such a distance is called a coherence time. This time is the same irrespectively of how many antennas the base station has and, therefore, you still need to estimate the channel once per coherence time. The same applies to the frequency domain, where the coherence bandwidth is determined by the propagation environment and not the number of antennas. When you get a new realization (at the top of the flow-chart), you compute an estimate (e.g., based on uplink pilots), then you use the estimate to compute a new receive combining vector and transmit precoding vector. It is when you have applied these vectors to the channel that the hardening phenomena appears; that is, the randomness averages out. If you use maximum ratio (MR) processing, then the random realization h1 of the channel vector turns into an almost deterministic scalar channel ||h1||2. You can communicate over the hardened channel with gain ||h1||2 until the end of the coherence time. You then start over again by estimating the new channel realization h2, applying MR precoding/combining again, and then you get ||h2||2 ≈ ||h1||2. In conclusion, channel hardening appears after coherent combining/precoding has been applied. 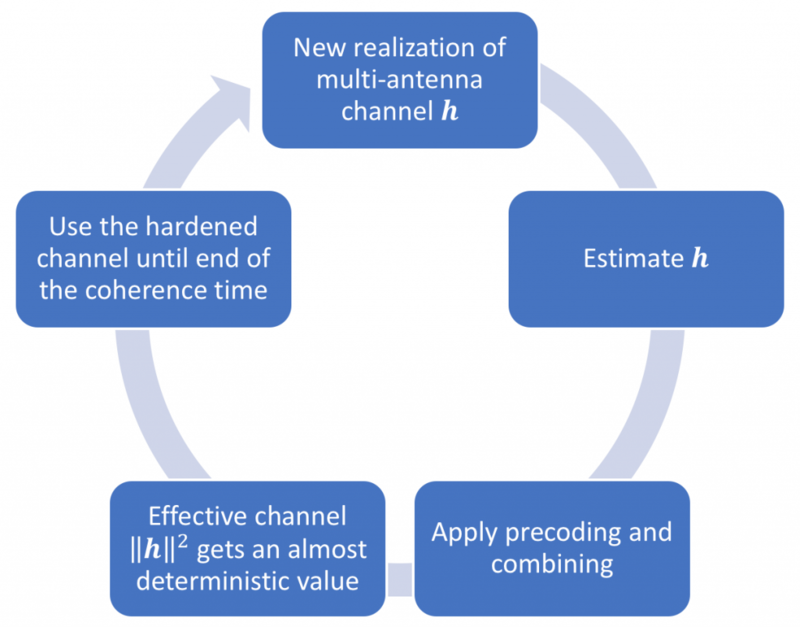 To maintain a hardened channel over time (and frequency), you need to estimate and update the combining/precoding as often as you would do for a single-antenna channel. If you don’t do that, you will gradually lose the array gain until the point where the channel and the combining/precoding are practically uncorrelated, so there is no array gain left. Hence, there is more to lose from estimating channels too infrequently in Massive MIMO systems than in conventional systems. This is shown in Fig. 10 in a recent measurement paper from Lund University, where you see how the array gain vanishes with time. However, the Massive MIMO system will never be worse than the corresponding single-antenna system. Since the spectral efficiency (bit/s/Hz) and many other performance metrics of interest depend on the SNR, and not the individual values of the three parameters, it is a common practice to normalize one or two of the parameters to unity. This habit makes it easier to interpret performance expressions, to select reasonable SNR ranges, and to avoid mistakes in analytical derivations. There are, however, situations when the absolute value of the transmitted/received signal power matters, and not the relative value with respect to the noise power, as measured by the SNR. In these situations, it is easy to make mistakes if you use normalized parameters. I see this type of errors far too often, both as a reviewer and in published papers. I will give some specific examples below, but I won’t tell you who has made these mistakes, to not point the finger at anyone specifically. Electromagnetic radiation can be used to transfer energy to wireless receivers. In such wireless energy transfer, it is the received signal energy that is harvested by the receiver, not the SNR. Since the noise power is extremely small, the SNR is (at least) a billion times larger than the received signal power. Hence, a normalization error can lead to crazy conclusions, such as being able to transfer energy at a rate of 1 W instead of 1 nW. The former is enough to keep a wireless transceiver on continuously, while the latter requires you to harvest energy for a long time period before you can turn the transceiver on for a brief moment. The energy efficiency (EE) of a wireless transmission is measured in bit/Joule. The EE is computed as the ratio between the data rate (bit/s) and the power consumption (Watt=Joule/s). While the data rate depends on the SNR, the power consumption does not. The same SNR value can be achieved over a long propagation distance by using high transmit power or over a short distance by using a low transmit power. The EE will be widely different in these cases. If a “normalized transmit power” is used instead of the actual transmit power when computing the EE, one can get EEs that are one million times smaller than they should be. As a rule-of-thumb, if you compute things correctly, you will get EE numbers in the range of 10 kbit/Joule to 10 Mbit/Joule. The noise power is proportional to the communication bandwidth. When working with a normalized noise power, it is easy to forget that a given SNR value only applies for one particular value of the bandwidth. Some papers normalize the noise variance and channel gain, but then make the SNR equal to the unnormalized transmit power (measured in W). This may greatly overestimate the SNR, but the achievable rates might still be in the reasonable range if you operate the system in an interference-limited regime. Some papers contain an alternative EE definition where the spectral efficiency (bit/s/Hz) is divided by the power consumption (Joule/s). This leads to the alternative EE unit bit/Joule/Hz. This definition is not formally wrong, but gives the misleading impression that one can multiply the EE value with any choice of bandwidth to get the desired number of bit/Joule. That is not the case since the SNR only holds for one particular value of the bandwidth. In summary, even if it is convenient to normalize system parameters in wireless communications, you should only do it if you understand when normalization is possible and when it is not. Otherwise, you can make embarrassing mistakes, such as submitting a paper where the results are six orders of magnitude wrong. And, unfortunately, there are several such papers that have been published and these create a bad circle by tricking others into making the same mistakes. 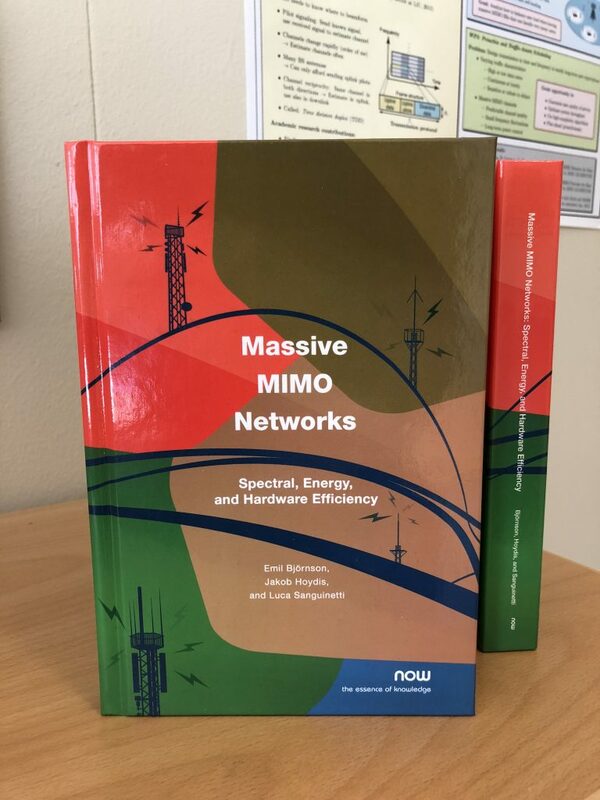 The hardback version of the massive new book Massive MIMO Networks: Spectral, Energy, and Hardware Efficiency (by Björnson, Sanguinetti, Hoydis) is currently available for the special price of $70 (including worldwide shipping). The original price is $99. Note: The book’s authors will give a joint tutorial on April 15 at WCNC 2018. A limited number of copies of the book will be available for sale at the conference and if you attend the tutorial, you will receive even better deal on buying the book!